To activate the new theme, move the cursor to the selected theme and click on the button “Activate”. The changes take effect immediately. If you have made any changes in the styles of the current theme, when you activate a new theme, all your changes will be lost. To prevent this trouble, save the current theme before activating a new theme. You can upload to your server any number of themes. As much as you need. To visit the repository of the STB themes, click “More Themes…” button. 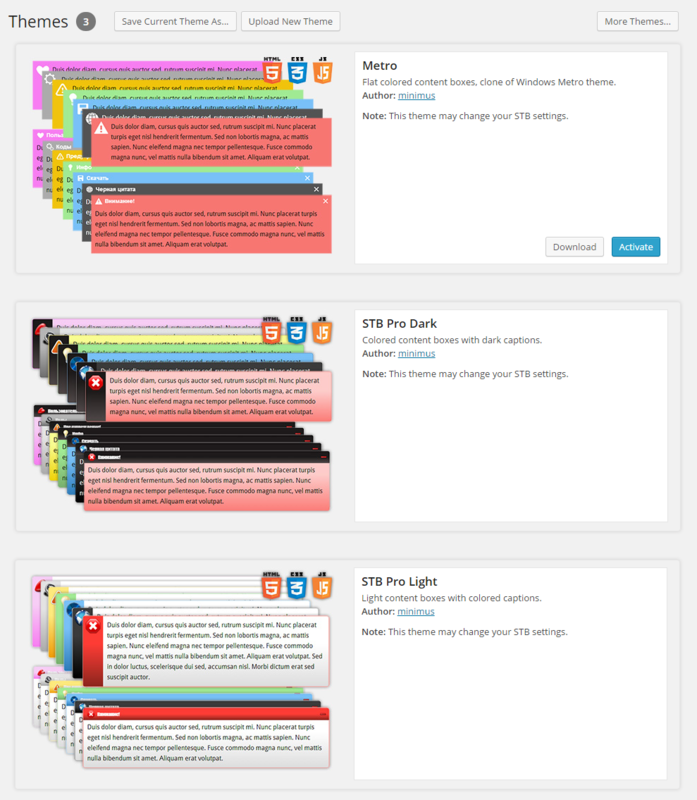 Download to your computer as many files of STB Themes as you want. 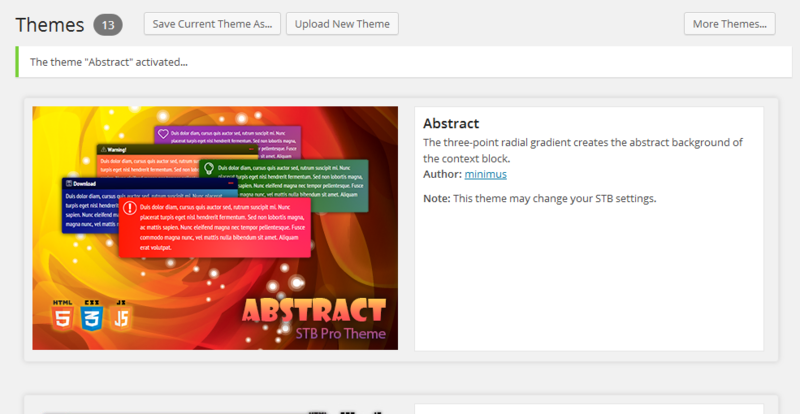 Go to the STB Pro Themes Page and click button “Upload New Theme“. In opened window select any STB Pro Theme file (zip) and click Select. You can upload only one theme for one time. After uploading all downloaded themes, select suitable theme and activate it. Security of downloading files is provided by the system of WordPress identification (nonces). Uploading files to the server can be made only from the Admin Side of your blog and only by admin of blog. If you made small changes of the current theme or changed it beyond recognition, we can say that you have created a new STB theme. To avoid losing your changes, or to share it with your friends, you need to save a modified theme. If you want to share this theme with friends or place it in the STB themes repository, do not forget to prepare the cover image for your new theme. Click “Save Current Theme” and fill fields in opened window. Theme Name (required) – Any name for the theme that you like and will conform to what you want to portray. Theme Slug (required) – Usually the theme name in lowercase with a prefix “stb_pro_”. Instead of a spaces use an underscores. Permissible only Latin lowercase letters, numbers, and underscores. Theme Description (required) – Short but capacious description of the theme. Cover Image – An image that will be displayed in the list of the plugin’s themes on the page “Themes”. Will also appear in the themes list of the STB themes repository, if you want to place your own theme in the repository. Insert image URL or upload image and select it using Media Library. Author Name – Your name or nickname. Automatically filled by your login name, but you can change it. Author URL – URL of your blog or URL of home page of your STB Pro themes. The author’s name and the author’s URL will be displayed as a link below the description of the theme. Feel free to send me your theme. If the theme will be interesting, it will be placed in the repository. 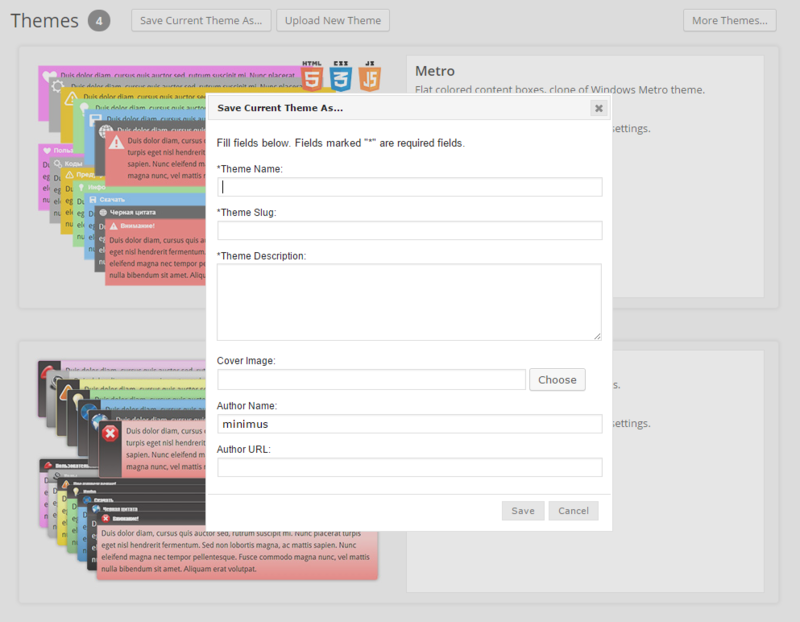 You can place the themes created by you in the STB themes repository. Also you can distribute or sell them yourself from your own site. To download the saved theme or any other theme, move the cursor at the selected theme and click the download button located under the description of a theme. © 2014, minimus. All rights reserved.